Did you know there are many Different Exotic Tropical Fruits from Around the World that you can Find in Honduras? Being a tropical country, there are many different exotic tropical fruits available in Honduras. Many of these are native to Central America, such as the cacao, cashew, nance and many others. All of the above are of course widely available not only in Honduras, but also throughout the rest of the Central American countries. Among these native exotic tropical fruits available in Honduras, you will find the cashew; a truly weird fruit: the cashew seed that we like to eat, is actually on the bottom outside of a fleshy fruit like body that looks a bit like an apple. 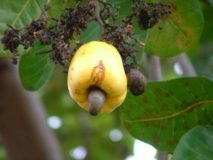 Cashews can be yellow, orange and even red, and the fruit has a rather tangy flavor with a significant aftertaste that is very persistent. As such, it is seldom eaten, however some people do make a fruit juice out of it which is interesting and should be tried at least once! They also make a cashew wine out of it, which is actually quite tasty! Cashew is native to Honduras, and although you will find the larger cashew plantation along the Pacific coast, it is also found in the Caribbean coast and at the Bay Islands. Cacao is another interesting fruit, and you would never guess that it is the main ingredient to produce chocolate either. This fruit has a fleshy meat surrounding the seeds on the inside of a hard and thick shell. The locals eat the fleshy meat and discard the seed. Cacao is native to the hot humid lowlands along the Caribbean coast of Central America, and you will find many plantations within Atlantida. There are however many exotic tropical fruits available in Honduras that are not native to our country. Many of these were actually brought by the different fruit companies that established themselves in Honduras. It is true that the main crop that these fruit companies were producing in Honduras was the banana. But it is also true that they did extensive research to find other fruits that could become an important cash crop for them. As such, the largest tropical botanical garden in the Americas, Lancetilla, was born as an experimental farm. There, a variety of different exotic tropical fruits where planted, and their production was closely watched and scientifically documented. The African Palm plantations that you see along the Caribbean Coast of Honduras are a perfect example of a successful agricultural import. Perhaps the most popular of all exotic tropical fruits available in Honduras is the Rambutan. Locals call them “lichas”, Rambutan is a hairy looking fruit that is native to Southeast Asia. It grows incredibly well in the North Coast of Honduras. You find them along the road between El Progreso and La Ceiba. They are also available at the local markets and supermarkets, and have even become a product worthy of export. 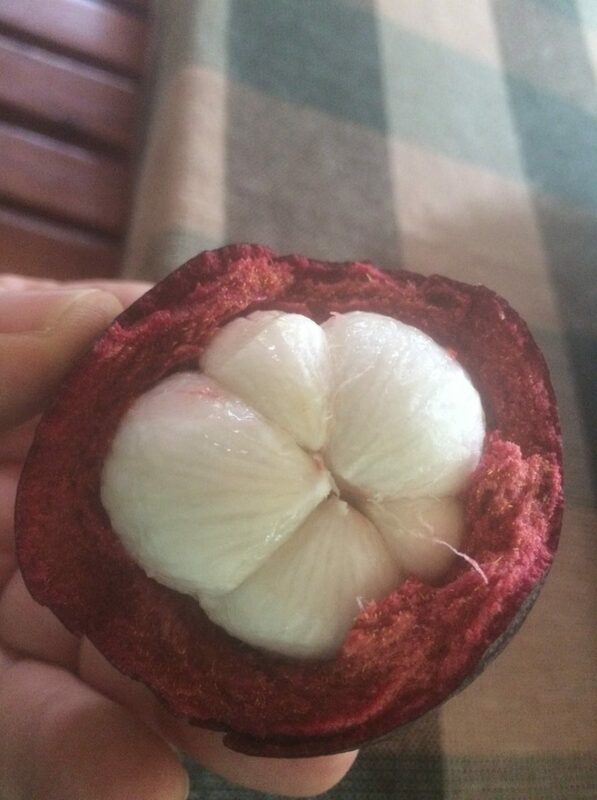 Of all of these unique exotic tropical fruits available in Honduras, there is one that is truly outstanding: mangosteen. This fruit has not become as popular as Rambutan because it takes a tree an average of 10 years before it begins to bare fruits. This is truly a long time to wait for most landowners seeking for a cash crop. Yet, after the long wait, you have a magnificent fruit that is worthy of royalty! 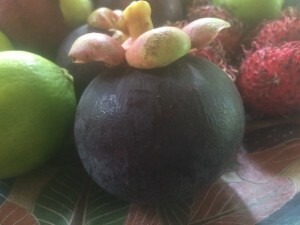 Mangosteen, a delicious exotic tropical fruit native to Southeast Asia that grows very well in Honduras. Mangosteen is a purple fruit, whose size, form and color reminds me of beets. The skin is thick, and inside you will find a pulpy white product that resembles garlic in looks. However, it could not be more different to garlic in taste and texture as it is! It has a soft, juicy texture. I cannot really describe the taste, but it is absolutely delicious! Sweet, tangy, very unique, truly a culinary experience just to taste this delicious tropical fruit. Mangosteen is more readily found in Atlantida, along the north coast of Honduras. In season you can find it in the cities of Tela and La Ceiba. You can also find them in the upscale supermarket “Los Andes” in San Pedro Sula. During season, you can find them along the CA13 highway just outside of Tela, in the direction of San Pedro Sula. You can also find them in the markets in Tela and La Ceiba. I am not of fan of stopping and buying things along the road, but of you are driving along the road, or have a private driver that is taking you to or from Tela towards San Pedro Sula, make sure you have him stop and by all means, buy some! It is truly out of this world! You will be happy you did stop and taste these delicious exotic tropical fruits available in Honduras. Some of the small resorts in Atlantida actually have a tree or two in their property and will be happy to share their fruits with you. La Villa de Soledad B&B loves to share their mangosteen fruits with their guests. It is truly a fruit worthy of royalty! Last, but not least, did you know that vanilla is native to Central America?